A new edition of the Jordan CMFT Viz Air 13 is scheduled for release anytime this September and it is expected to make noise once again. This elegant silhouette from Jordan Brand will come out in White/Varsity Red – Wolf Grey – Black colourway, which is tagged as one of the best CMFT Air releases. 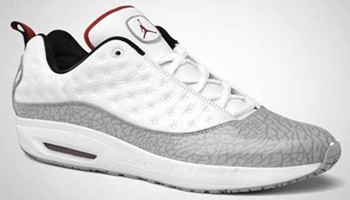 The shoe features an elephant print in a patent white leather with an air sole unit and a wolf grey outsole. The shoe looks simple, but it is definitely impressive so it will be worth your money!